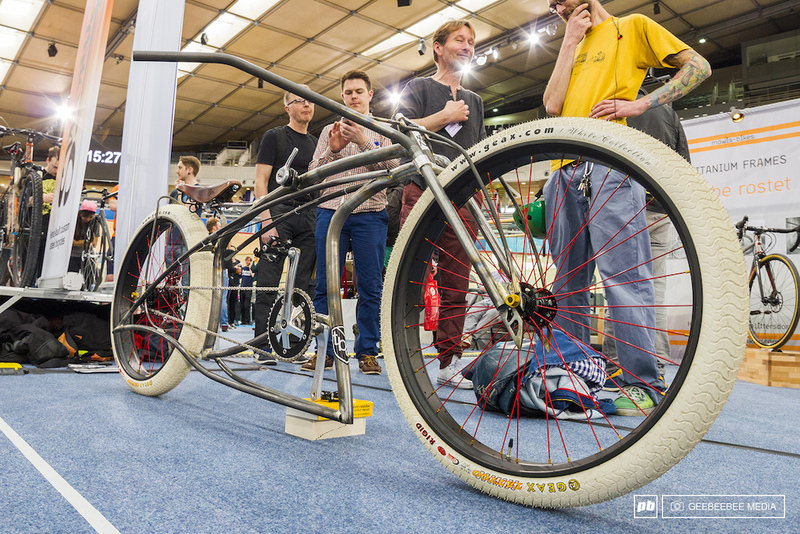 It's an exciting time for handmade bicycles in the UK and the organisers of Bespoked - The Handmade Bicycle Show 2014 - organised an impressive line up of over 120 exhibitors at one of the biggest and newest all-round cycling venues in Europe, the Lee Valley VeloPark, London. The VeloPark is nestled in the newly opened Queen Elizabeth Olympic Park, which includes a brand new one-mile floodlit road circuit, the remodelled and floodlit Olympic BMX track and 8km of mountain bike trails. Cycling in London has a new home for fans of track, road, BMX and MTB. 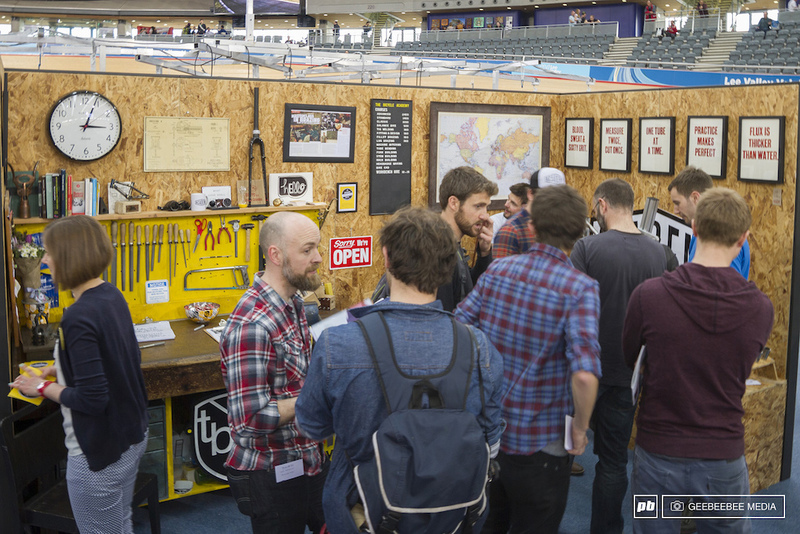 Centred in the iconic and award-winning 6000-seat velodrome where Sir Chris Hoy and his Team GB and Paralympic GB compatriots set the London 2012 Games alight, Bespoked was awash with companies and individuals representing a broad cross-section of the handmade bike industry and unlike other big cycle shows in the UK, this event had depth and heart, with people passionate about their own craft willing to let you talk about and test out their works of art and engineering mastery. It's not every day you get to visit an historic venue like the Olympic velodrome, let alone hold a bike show there! The bespoke bicycle industry is seeing more and more mountain bike-orientated frames being built, which, for a section of the industry where the traditional focus is on fixies and track bikes, is encouraging for those who design and build their burlier cousins. Swarf Cycles were showing two bikes at the show, firstly their Curve trail bike and the Spline, their custom-geometry hardtail. The Curve uses a high-pivot design with an idler and the frame is made up of a fillet brazed steel front end with a hand-made carbon swing arm. We were hugely impressed with the detail in the craftsmanship and the story behind how the bike came into being. Adrian Bedford, the man behind Swarf, is a designer engineer in the aerospace industry, so it's no surprise that we see this sort of attention to detail in the form of the frame. Adrian has been working on the Curve prototype for a few years, as you can see from Swarf's Facebook page. The bike can be run in either 130mm or 150mm travel settings, depending on shock stroke, and has a variable head angle (65.5-66 degrees), via a flip chip. The bike can work with 26" or 27.5" wheels and has bolt-on dropouts to cater for either 12mm or QR axles in either 135mm or 142mm spacing. In total, a small Curve frame weighs in at 6.5lb/3.1kg, excluding shock. The Curve's beautifully formed carbon swing arm is made by hand at Adrian's home workshop in Dorset, UK. 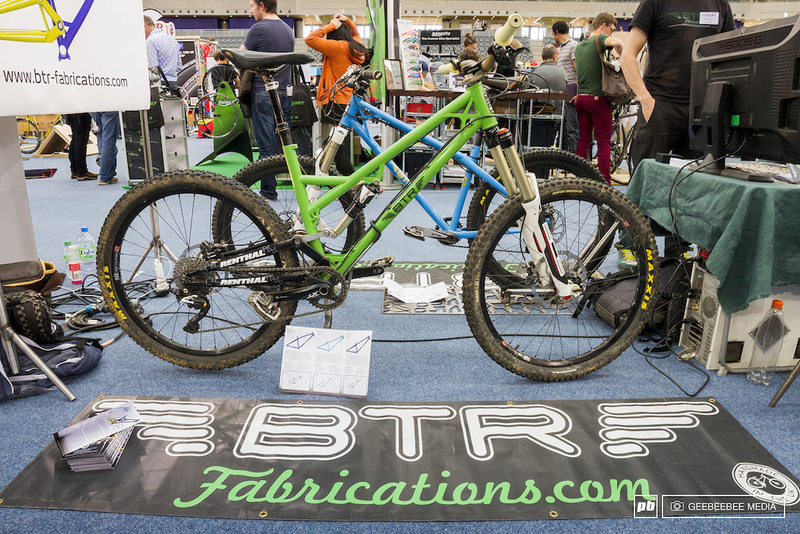 We were pleased to see BTR Fabrications slap bang in the middle of the show this year, moving from being 'New Builders' to 'Exhibitors'. BTR has come a long way since we filmed them in their shed in Littlehampton just last year as they've upped sticks and moved into The Bicycle Academy in Frome, Somerset. Not only have they been busy settling into their new workshop and building frames such as the Ranger, Belter, Ripper and Ignitor, but they've also been hard at work designing their next entry into the mountain bike market, the Pinner. The Wrath was custom built to a client's exacting specifications, down to a custom linear, progressive leverage ratio similar to an old Turner DHR. The frame was also designed specifically to accommodate a BOS fork and shock. Reynolds Technology, (founded 1841), are a British brand who have been synonymous with the bike industry for over 100 years. Although famous for their steel tubing, the company now makes custom aluminium, magnesium, titanium and carbon fibre products, together with their huge range of steel alloys. Reynolds have been in the business longer than most and they're always developing new alloys, such as 953 'SuperSteel'. Built just days before the show, Cloud 9 Cycles' latest build was designed by a mountain biker who likes to race through the streets of London. He wanted best of both worlds, something capable of getting up to speed fast and maintaining it, but also capable of taking in drops down kerbs and stairs. Just think what Chris Akrigg could do with a machine like this! According to the designer-builder, this bike is a blast to manual in straight lines or around corners. Watch out London! If you're not a fan of big-wheeled bikes, look away now! There are ten of these 36er bikes in the world at the moment, build by PIM Cycles in York, UK. Four are in the UK, with others as far afield as Switzerland, Australia and Canada. The owner of this one said that he often rides it in Dalby Forest, used as a UCI World Cup XCO venue in 2011, and has managed to cut 30 minutes off his usual ride around the the Red Run by riding his 36er. It was great to see Curtis Bikes together with company boss, Gary Woodhouse, at the show, showing off more or less their full range, from XC 29ers and all-mountain 650B machines to their 24" BMX cruiser and prototype 4X rigs. As with all the bikes at the show, all of Curtis's frames are hand made, although with a Curtis bike, every frame has a customer’s name on it, and they still offer either 'factory' or 'custom' options for each model. Factory frames are based on tried and tested geometry, with customers able to choose some personalised touches, whereas their custom frames can be tailored to specific geometry requirements, with personalisation right down to what dropouts you prefer and of course, a matching custom sticker set! The super-slack prototype 4X RaceLite in Reynolds 853/525 steel, what else! Known for their popular frame-building course that teaches novices how to build a bike from scratch - with that bike then being sent to Africa to transform someone's day-to-day life - The Bicycle Academy is now two years old, and going from strength to strength. TBA was established after an incredibly successful crowd-funding campaign in 2011, and is one of the top 20 startups in the UK...proof indeed that the bespoke bike industry is very healthy. A home away from home...TBA's stand reconstructed their workshop at the show in a small but perfectly welded way. 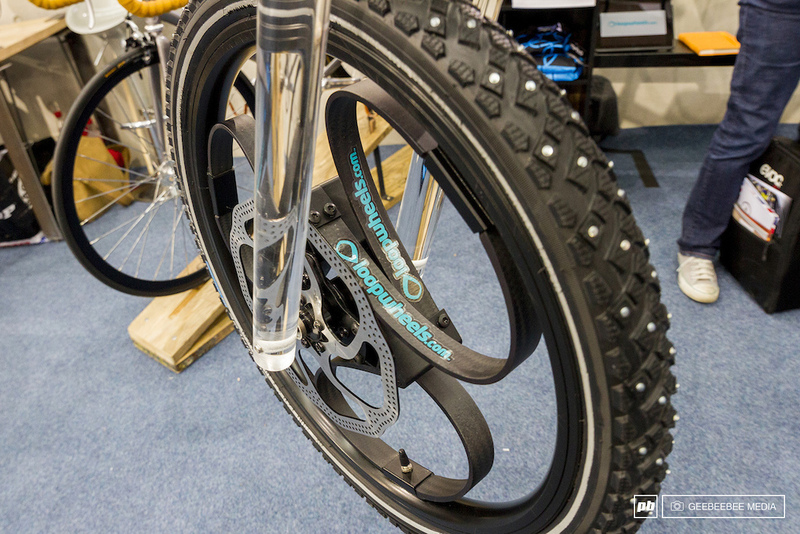 Ryde (formerly Rigida), has been producing wheel rims since 1908, mainly for the city bikes sector, but are now moving in to the mountain bike sector with a couple of exciting and innovative products. Ryde's new Trace XC, Trace Trail and Trace Enduro rims. Hailing from Taiwan, AOI. Cycle is a rare breed indeed; a hand-made bicycle company from the traditional home of the mass-produced mega-brand production lines. AOI. Cycle's bikes probably won't appeal to the gravity-thirsty masses, although their attention to detail is laudable. The company produces less than 100 bikes a year, offering extensive customisation, and Ken Aoi, the company's designer, treats every frame - made from SUS304 stainless steel and hand-ground and hand-polished - as a work of art. Futuristic hand-made chic from the home of industrialised bike production. Limit Fabrications’ August Wheelworks (in Volkswagen Manilla Green, below), is the first 29er to feature an ultra-compact 410mm rear end, courtesy of a structurally integrated kinked carbon seat tube. With internal cable routing and super detailed engineering throughout, this was an incredibly well put together machine. Built from a design from reputed wheelsmiths, August Wheelworks, Limit’s Pat Banks worked wonders to cram so much good stuff into one cracking piece of custom building. With a strong heritage in designing and building custom BMX frames, Limit Fabrications now produce unique road, track and mountain bike frames from their base in Norfolk, UK. Whilst on the subject of wheelbuilders, the guys at Strada not only build a whole variety of custom wheels - from fat bikes to road bikes - they also use a hydrographic printing technique to apply custom graphics to their rims, so if it's skulls you fancy, skulls it is! With a stand full of wheels of all shapes and sizes, could we see a fashion for personalised graphics on MTB wheel rims soon? Breaking with a few hundred years of tradition in wheel building, Loopwheels brings to the market something slightly different with their carbon fibre-spring based system. The loop design is aimed at reducing 'road noise' vibration that travels throughout the bike and up through your arms to the rider's wrists and shoulders, giving a soother ride. Unlike suspension forks, which only work in one plane, the Loopwheel is designed to provide tangential suspension so they respond to square-edge hits head-on in the same way as they do with impacts from below. We rode a Dahon commuter bike, set up with the wheels, around the show and it was a noticeably smooth ride, although testing these out on something more that a carpeted floor would give them a proper real world test. Taking the wheel debate to the next level. We're looking forward to seeing the 26" version of Loopwheels. Currently, Loopwheels only come in the 20" size, but are supplied either as a wheelset for retrofitting, or come included on the off-the-peg Dahon Mu Uno commuter bike. The wheels can also be set up with a built-in gearbox hub or for use with a traditional cassette, and both hub and disk brake versions are available, with weights comparable with traditional spoke-based wheels. The team behind the invention is currently developing the technology for both 26" and 29" wheel sizes as well as for other applications like wheelchairs. With a background in motorsport, Dan Titchmarsh's days of working on designing and building motorcycle frames with his father have culminated in an obsession with bringing quality bespoke bikes to the discerning rider. From his workshop just outside York, Dan builds unique one-off tailored bikes for people around the world that share his love for clean aesthetics and sleek form. Dan is softly spoken though immensely passionate about his creations, giving us a description of his latest show-winning build for a Swedish client, in the minutest detail, covering its design and construction more or less from start to finish. Dan spends long days in his workshop crafting all the elements of the bike, down to custom machined stainless Maxle dropouts, whilst ensuring the cable routing has just the right balance between art and function. Dan's bike won 'Best Off Road Bike' at the show and we can't wait to see what he turns up with next year. Elegant cable routing and an all-round masterpiece from the hands of Dan Titchmarsh. Designed as a sleek, minimal commuter bike that would excel during the toughest of Scandinavian winters - frozen lakes, snow-covered trails and pot-holed roads - most people would be tempted to hang this up in a museum rather than ride to work on it. Coming from Prague in the Czech Republic, each Festka bike is built from parts all hand-made by a collection of workshops across the country. Each frame comes with a birth certificate, signed by all the bike's builders, adding that ultra personal touch. 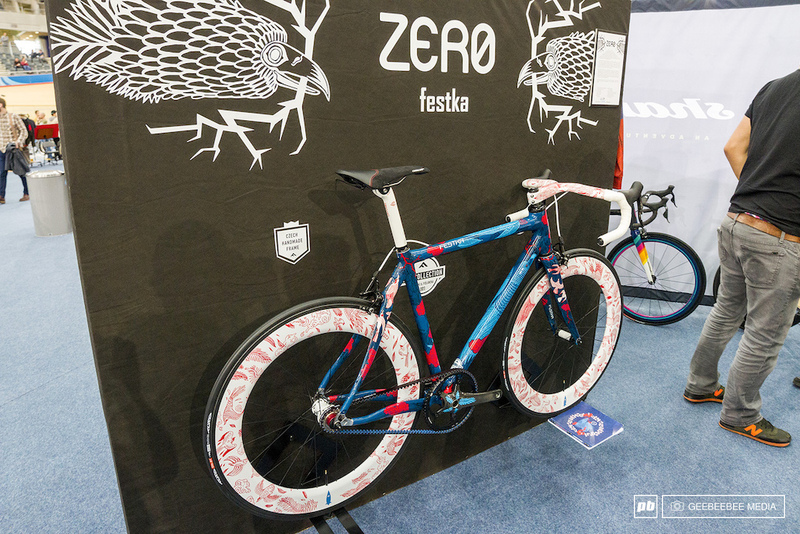 The incredibly distinctive Festka bike has become a bit of a regular at bike shows, but that doesn't diminish its beauty or the Festka team's passion for creating these awesome bikes. Over the years, we've seen numerous types of gearing solutions that dispense with the traditional cassette and derailleur system, with most designed to allow for some combination of faster gear changes, shifting gear without pedalling, weight reduction or minimising damage to expensive componentry. Even the big manufacturers have entered into this space, with products such as the SRAM G8 and Shimano Alfine (as used in the Zerode G1 and G2 DH frames) and Nexus. However, in general, the mountain bike sector has stuck to more specialised products from companies such as Rohloff, Pinion, Fallbrook (Nuvinci) or Universal Transmissions (G-Boxx). 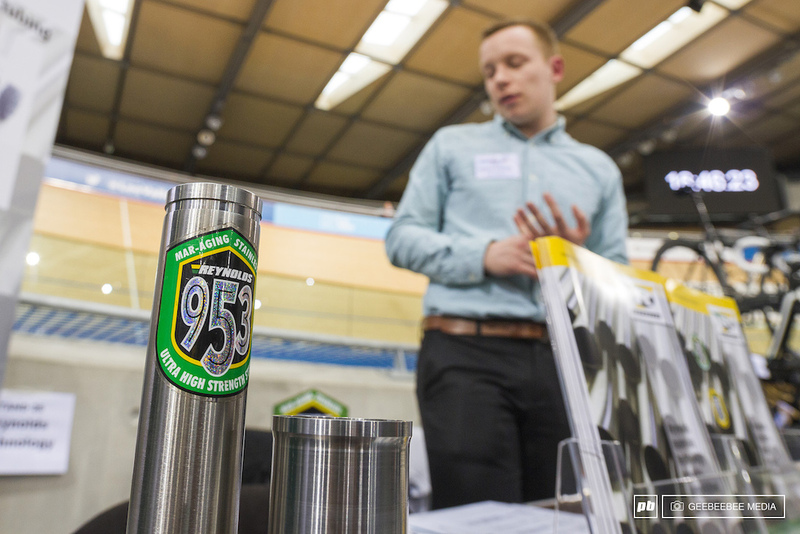 At the show, we counted numerous bikes fitted with IGH (internal gear hub) devices, and the odd few with bottom bracket-based systems, using both traditional chains and belt drives, although the most popular replacement gearing system was definitely the Rohloff Speedhub 500/14. 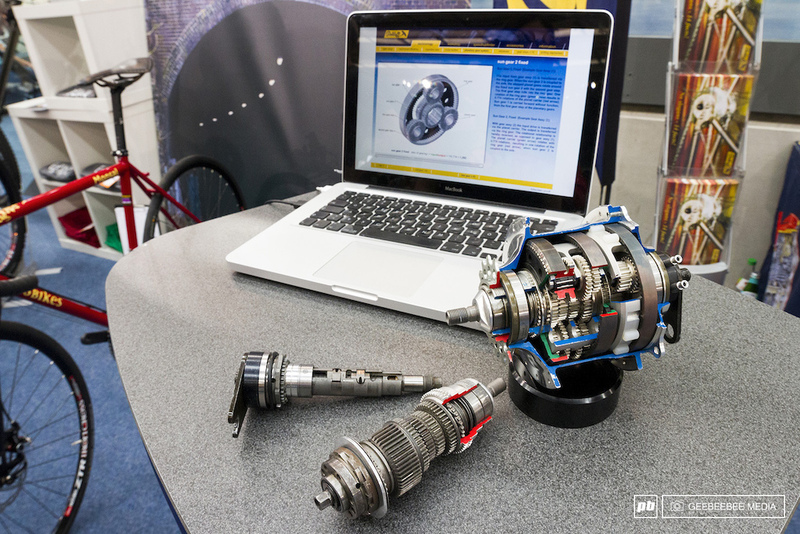 The Speedhub comes in two main versions, suited to either rim brakes or disk brakes, and of the 190,000+ units in service, Rohloff claim not to have had even one returned due to wear or internal component failure. Whether you like the idea of IGH devices or not, packing 14 gears into this 4lbs/1.8kg unit is quite a feat of engineering! The Scottish-built Shand Stoater Plus uses a Gates Carbon Drive system with a CenterTrack carbon fibre reinforced polyurethane belt combined with a Rohloff Speedhub 500/14 for ultra slick pedalling and shifting efficiency. Shand's range of bikes are aimed at road, off road, cyclocross and mountain-bike crossover uses, and we'd love to see them come out with a mountain bike hardtail fitted with all these innovative gearing systems. The Shand Stoater Plus...dripping with innovate drive and gearing technologies. 18 Bikes, based in Hope in the Peak District, are a company with two distinct sides. On the one hand they are a traditional bike shop, custom-building bikes based around well known chassis from Santa Cruz, Transition and Cotic, whilst on the other hand, they offer a range of hand-built 'Workshop Series' frames or can start from a clean slate on a 'Custom Frames', so the sky's the limit on what they can produce. 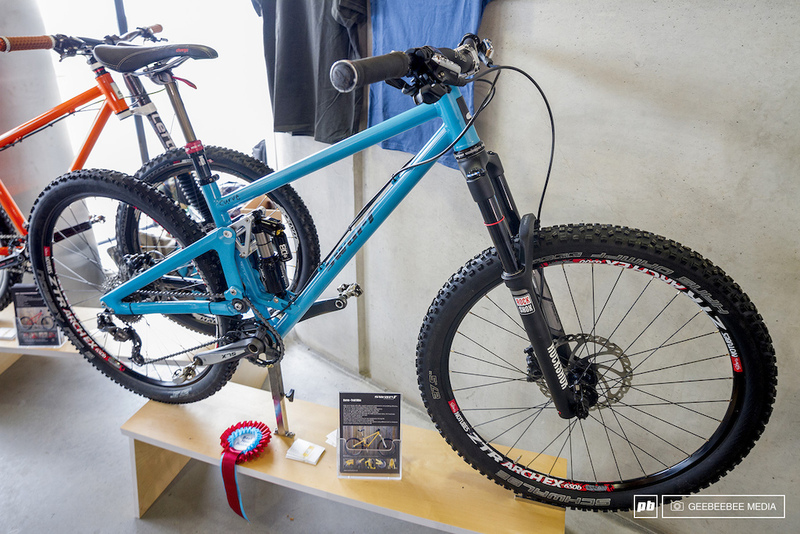 Fresh for 2014, they have developed their Pinion P1.18 gearbox Custom Frame, and whilst the model they had on display was a classic MTB hardtail, 18 Bikes can adapt the gearbox-centric frame design for other applications such as on a tourer, tandem or fat bike. In addition, you can chose how you want your frame welded - TIG or fillet brazed, depending on the tubing you select - with geometry, cable routing, colour, dropouts and just about anything else you can think of, available as an option. Pinion's P1.18 gearbox, nestled at the heart of 18 Bikes' new custom hardtail. 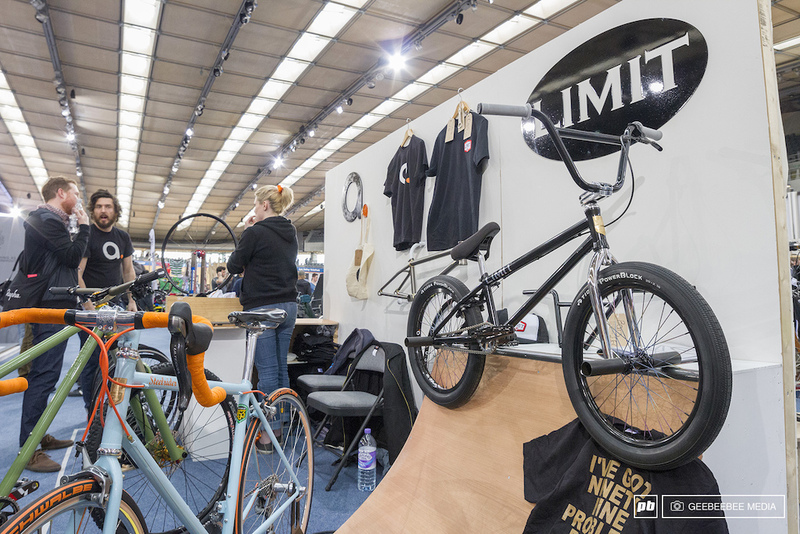 With over 120 exhibitors at the show, and practically every conceivable style of bike on display, we couldn't get the lowdown on every product out there, but here are some of our show randoms, with practically everything being handmade. Ted James Design is almost a one man army, crafting these insanely desirable BMX frames (and almost anything else you can think of), in Stroud in the UK. Peter's Bike's Peter Tomasz - trained at The Bicycle Academy - brought along this amazing ready-to-ride roadster. 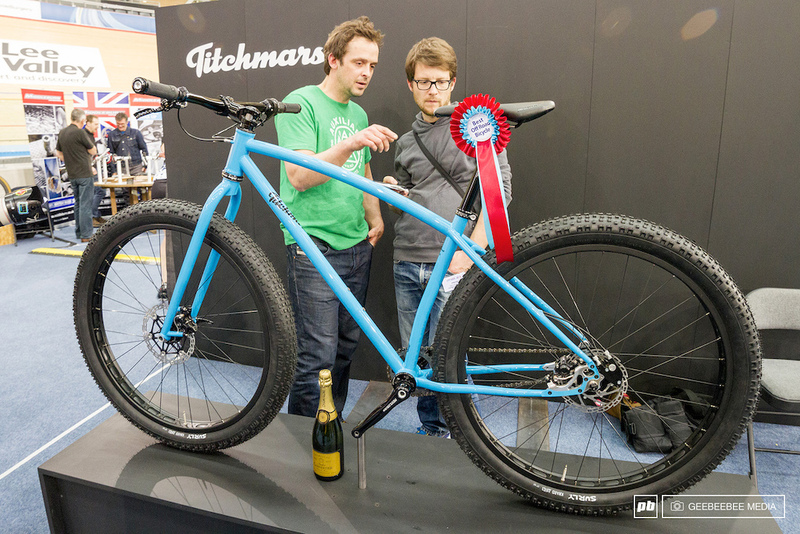 Fat bikes, road bikes, epic trekking bikes covered in dirt, bikes with trailers, twin shock bikes and of course Guy Martin's land-speed record bike (clocking 112.94mph/181.76km/h) and built by Rourke, were all on display. 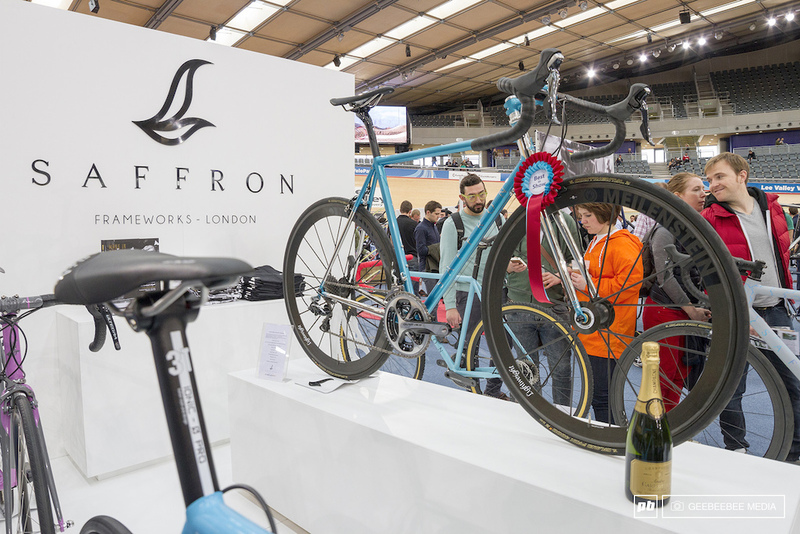 Saffron Frameworks won best in show with this fully stainless steel road bike. You can't beat a bit of King...or I9, come to think of it, courtesy of Evolution Imports and Just Riding Along. Of course the show featured a lot of road bikes, with production quality and attention to detail way higher than industrially-produced machines, together with some unusual machines such as Inspired Cycle Engineering's trans-Antarctic 'ice-trike', complete with fat tyres, built for British polar explorer, Maria Leijerstam. Veloboo brought this sleek, svelte and super-tidy looking bike along to Bespoked all the way from Hungary. From a distance it looked like hydro-formed aluminium or expertly laid carbon...but was in fact a patent-pending all-bamboo construction, weighing less that 22lbs/10kg fully built. With only 30 bikes being made and each one finished in 24K gold plating, it's probably not ideal for a quick ride down to the shops! Prepare to part with £31,250 ($52,500 USD) for your bit of bamboo bling! You can check out the full photo gallery here. Please pinkbike, test that 18 bikes pinion p1.18!!! Looks like the step in the right direction to me. That botom bracket gearbox brings all the heavy stuff to the center of the bike. Maybe rohloff could release a lighter hub with less gears or move the gears to the bottom bracket? I see more innovation in bespoke that in the rest of the shows combined! I am just feeling like; the limit on my credit card is too low, my bedroom is getting too small for bike storage and i really wanna go to the London Olympic park! The p1.18 doesn't even need 18 gears, if it had 10 gears with a wide range, that would be enough for most people. what's heavier. a gearbox, a rohloff or a standard mech and cassette? what breaks all the time? derailleurs. I'd take a lot more weight in the middle of my frame if I could forget about my drive train for a season at a time. no but actually what is the weight comparisons. I haven't the slightest idea. how much does the average cassette and shifter weigh, what does the average gearbox weigh and well that rohloff hub weighed 1.8kg. is that a light rohloff or an average one? its an honest question. It's a tricky question as an integrated gearbox, like the Pinion, needs a custom-designed frame, so likely more metalwork, although the weight of the gearbox will likely be around the same as a Rohloff IGH. But as radatabs says, reliability and serviceability go to a gearbox or IGH...and depending on your setup, you of course save weight on at least one shifter and cabling. In all, I think IGH or gearbox solutions are currently a little heavier, but as the engineering gets more and more compact and reliable, I can see external gearing slowly disappearing for some applications. When Rohloff released their IGH a million years ago, it was the same weight as the then XTR, but now XT is lighter than what XTR was back then. The problem with IGH is unsprung weight - all that mass right on the back tire. They do last forever. They take a few YEARS to break in. Germans. I think the Rohloff is overbuilt. That could make one that is not built so well that is lighter and it would still run rings around the longevity of derailler systems in terms of durability. Shift while not pedalling. It is genius. @ harrybeaumont, Unfortunately, not if $hitmano & $PAM have anything to say about it. I hope Pink can do a full, unbiased review of that Pinion soon too. On tha real, what I could go for is a solid FR hardtail built from that super sick Reynolds 953 Stainless, brushed natural finish, with one of those Pinions bolted into the bottom. Maraging steels have strengths up to almost 400 ksi!!!!!! How f*cking awesome would a frameset in that stuff be, especially if it's stainless!!! No one needs 18 gears though Pinion. I do just fine with only one, gimme 5 or 6, 10 at the most which simplifies & lightens it further & you're gold! Pink bike did a short reveiw on one already. Have been waiting on a long termer for some time. I haven't seen them on the Nicolai site anymore. Love the loop wheels idea and the Pinion but they spell the death of a good portion of the bike industry if they catch on. Whats next? Tyres that have no air and last forever? Well he is fast, you know! Corrected now, thanks! Swarf Cycles - Beautiful bikes and a brand we need to look out for. In-house future for sure. And yes, Review the Swarf 'Curve' please. I would love to try the swarf, as well as that Limit Fab. 29er with 410mm stays! Probably the funnest 29er out there! Another vote for the Smurf I mean Swarf. That looks outstanding. ..what are you trying to start, pink bike? Yeah... them's be fightin' words! We don't take kiiindlee to dose kinda weelz raaand heeeerrrre...! @Pinkbike thats actually incorrect, if you check out Corky Coker, of Coker tires, largest antique tire maker in the world, located in Chattanooga, TN he actually has at least one 36" bike. He also makes his own custom tires, the words "Coker tires" are the tread and they have a couple 36" unicycle's as well. @bikermaniac101, not sure what we're incorrect about, as we didn't claim these were the biggest. We just said they were big, and to be honest, we'd have had to have done a ton of research to even find out about the Corker tyre. Good to know they're out there though! @Pinkbike, "There are 10 of these 36" bikes in the world right now" I never said they were the biggest, just saying there's more than "just 10". 36' is the new 650b. It rolls better than a 29er, more agile than a 26er, and newer than 650b. Next year we will be showing everyone our new SC Nomad 36'er. In 10 years, people will be saying "650b for life!" We don't need anything new! 650b has been all we need and I ain't spending more money! True. Quite literally as pretty much every bike featured on here is made of steel. good ole british stuff steel is y'know. Speshly from t'north. I agree with you one awesome article. I think it says a lot that the guy from Swarf is an aerospace engineer and chose to use steel for the mainframe. Same goes for K9, coming from a motorsports background. I highly doubt they use it for nostalgic or aesthetical reasons so steel must have its place in bike design. I think this is the longest I've ever spent looking at a PB article. Brilliant. That's a bike show. I know where I'd choose to go, and it wouldn't rhyme with Sikh Spotter. i was thinking the same. this show doesnt match my riding style but if you appreciate the dynamics of bicycles this is a walk in heaven. by far the most innovative, head turning show ive seen yet. 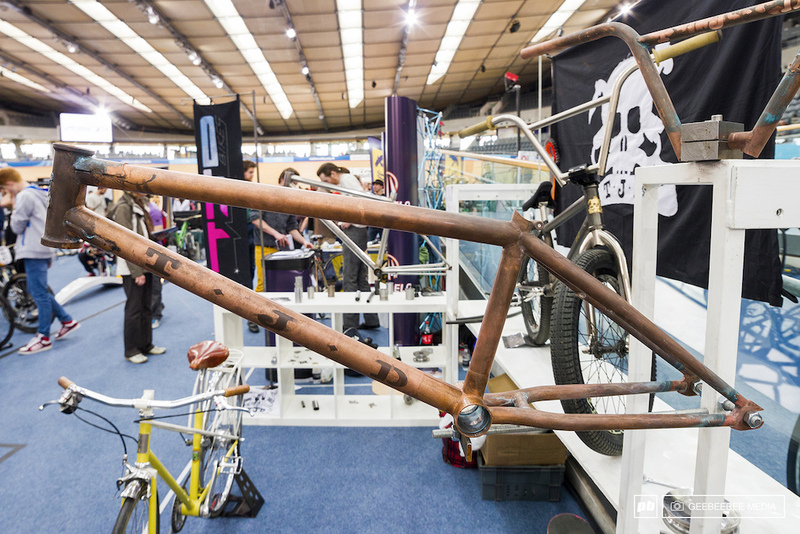 Some of the coolest things at the handmade bike shows. Amazing works of art. Well, how about the T45 tubing Curtis have used for ages, claiming it is superior to 4130 or Reynolds steels? Or that Sanko Japanese stuff they used for the cheaper frames? I wonder if they changed their opinion on material choice or it was more of a practical decision. That swarf frame blew me away!!!!!!!!!!!!!!!!!!!!!!! Great writeup! Really enjoyed! Loving all the steel and that BMX is just damned fine. never been on a fixie much less on a board track. never worn lycra unless it was underwear but i would chew the balls off a cheetah to take a fresh new fixie out on that track for a day. that 36er actually looks like it could be interesting to ride. i have heard you can easilly just ride them up stairs. i'd like to see what its like to have 10 inch bigger wheels. hey, under acceleration and braking wouldn't that weird carbon fibre suspension system coil up? what would that feel like, shooting forward and back? Bucking bronco! ye haw!! On a side note, you can all sell your 27.5 enduro bikes now, 36" is the future ! lets see im 48 now. I predict gear boxes will be popular on DH bikes. When im dead. You can have one: www.curtisbikes.co.uk/frames/curtis-racelite and even pick what steel you want it made from. The geo on their production model is very similar to the proto model, built for their 4X team rider, Ash Brown. 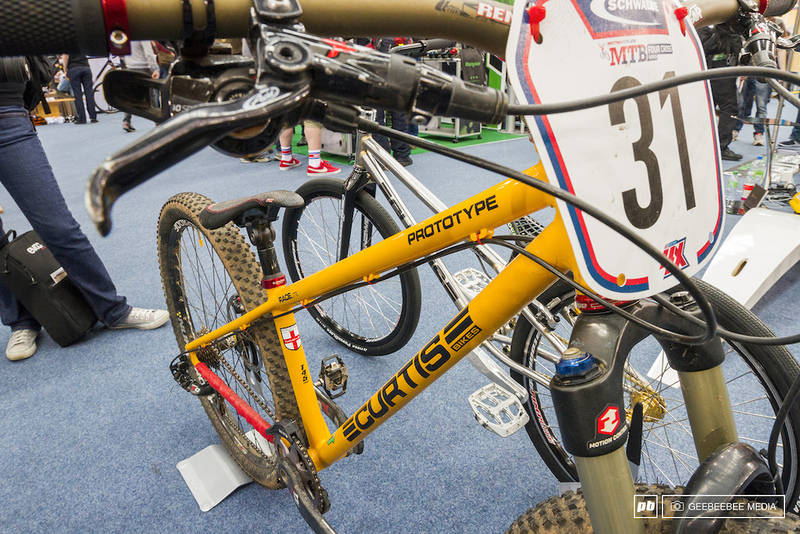 It's not the first time we have seen them in pinkbike articles but damn those Festka bikes are hot. The Cloud 9 roadie almost looks to be running XX1. Nice stuff at that show. That is a bike show I would go to. Hot damn! I've been lusting for a Pinion for a long time! I'm sure a 36er is real fun to ride. 29ers already feel sluggish. Can't believe this wasn't publicised. I work 2 mins from the velo drome! Sorry to hear you didn't see this was on, but keep your eyes peeled for next year's show at www.bespoked.cc. There are also quite a few regional shows in the UK and overseas as the bespoke bike industry keeps growing! We found this show so much more entertaining and informative than the typical UK bike shows, featuring the mass-produced brands. 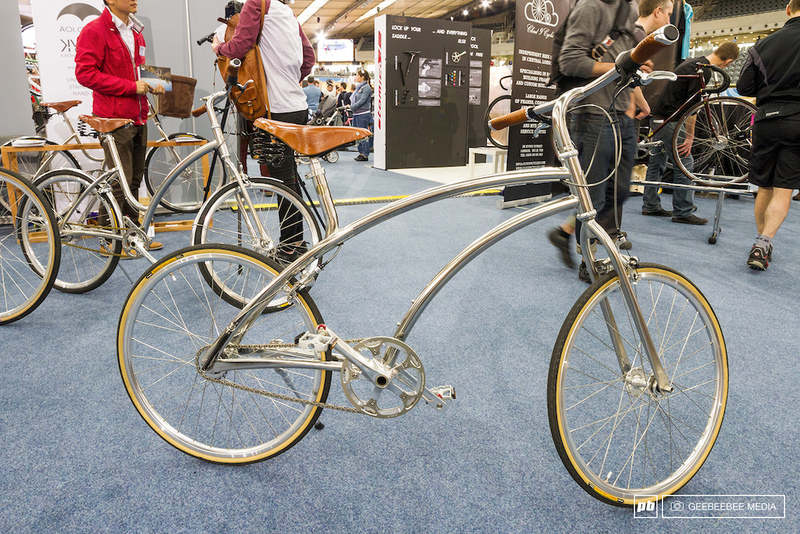 At this year's London Bike Show, we weren't even allowed to touch some bikes (!) and certainly swinging a leg over a few company's bikes was out of the question according to the stand staff as the bikes were apparently for demo purposes only. We weren't refused by a single builder at Bespoked! Swarf I like the most. Id love to have one ! Wow! - Some fantastic photos of some lovely work. It's across the main road from the velodrome, so we couldn't get any snaps. It's not the Olympic XC track though, just a short loop, but it looked pretty technical. CURTIS!!!!!!!! Soooo Stoked to see them still building!!! Steel is back... Yeah !